These ratings – “structured like a report card for school districts based on data such as state standardized test scores, attendance, graduation rates and whether students leave ready for college or careers” – are compiled somewhat differently from previous years’ scores. This system is supposed to allow for finer distinctions. The results of this assessment thrust the Festus district to the top of the county rankings. Last year, when I looked at high schools only, Fox was at the top of the list (based on average MAP scores across subjects). Festus High was 5th. At the bottom of the list, we have De Soto. The district’s high school did well last year (4th). There is a gap of 15% between Festus and Desoto. De Soto has had some controversy over the last year with a proposed unpopular change in its grading system and a dismissed superintendent. Note that Sunrise, a K-8 district near De Soto, had the worst average MAP score, but topped four other districts in MSIP score. This may be because Sunrise scored well in attendance and in subgroup achievement (test performance of minorities, free-lunch eaters and English language learners). Sunrise also doesn’t have to worry about MSIP standards related to ACT tests, AP courses, etc. since they don’t have a high school. Sunrise also is improving from year to year (by MSIP scoring standards), which helps the MSIP score. Go here to look up specific scores for your school. 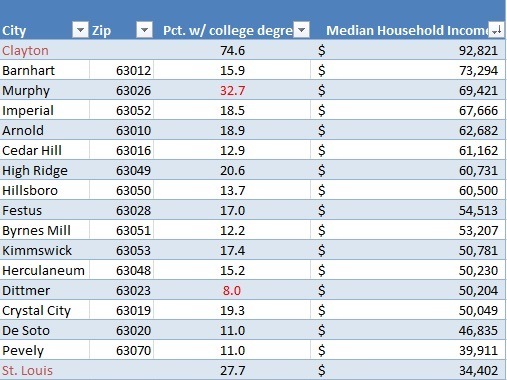 Conversely, Windsor had the 4th best MAP average, but had only the 8th-highest MSIP score in the county. I’m not really sure how MSIP scores correspond to MAP scores, but Windsor got low MSIP scores for high school math and middle school science that brought it down. Sunrise had low MAP scores, but high MSIP subject scores. The new Jefferson R-7 district continues to do well, placing third in the county this year. Here, Crystal City, Grandview, Northwest, and Windsor showed improvements in both categories. De Soto, Hillsboro, Jefferson, and Sunrise showed decreases in both. These are some numbers to consider when your school asks for approval for a tax increase or bond issue. The voters at Sunrise just approved such a measure. After trying for a couple of days to wade through the labyrinth that is the Missouri’s education reporting web site, I think I can discuss how our local schools fared on last year’s Missouri Assessment Program (MAP) tests). But some of this is still confusing, so I appreciate any insight you can provide in the comments. These tests are given every year as part of the federal No Child Left Behind program. These results help certify schools for accreditation (a designation schools in St. Louis and Kansas City currently lack), and they also determine school districts’ Adequate Yearly Progress (AYP), although Missouri, like 33 other states, has a waiver releasing it from having to meet these goals. These tests serve as a way for us to compare districts. Let me start with some linkage. It was not easy to find what I was seeking, so I hope these help you. AYP Summary – tells you at a glance how each district, or even each school within a district, performed on the whole vs. AYP. The factors included in AYP include test participation rate, attendance, graduation rates, and student performance on math and communication arts (aka reading or English) parts of the test. Student scores are broken down by race, ethnicity, disability, limited English, and free lunch status. Students in each subgroup have to meet the test threshholds (if that subgroup has a critical mass in the district, which is 30 kids for most subgroups). These grids do not contain 2012 information, presumably because of the aforementioned waiver. AYP Grid – gives you test scores for each subgroup, along with attendance and graduation figures, for districts and schools. Also tells you if each subgroup met the standard or not. See the bottom of page 2 for a legend that deciphers the many notations on the report. These numbers, and the ones in the database below, tell you the percentage of students who scored ‘proficient’ or ‘advanced’ for each subject (other score possibilities are ‘basic’ and ‘below basic’). These grids do not contain 2012 information. Post-Dispatch database – gives you an easy way to look up communication and math scores for each school for 2011 and 2012. State Achievement Report – see the number and percentage of students at each school or district that scored in each of the 4 levels (below basic, basic, proficient, advanced) for each subject. Includes 2012. To review AYP information for Jefferson County from last year, no district met the AYP benchmarks. This is because one or more subgroups at each district didn’t pass either math or communications at the required level. Windsor was very close – only the disabled students’ (officially called IEP, or individual education plan) score on communications missed the cut. The next best schools in this regard were Northwest, which made the grade for 9 of 14 groups, and Festus, which did for 6 of 10. Separately, but somewhat related, we can compare test passing percentages for each school (scores of proficient or advanced pass, as you recall). This tells us how kids do on the tests, regardless of groupings. If you aren’t really interested in how the subgroups fare, but how kids do overall, this is the place to look. 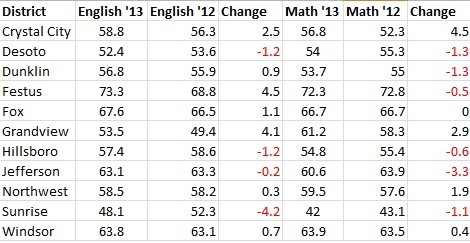 I have compiled a table that shows the percentage that passed English (aka comm arts) and Math for each high school for 2011 and 2012 (I didn’t want to do this for all grade levels, so I just did high schools, except for Sunrise, which only has an elementary school). I then summed English and Math scores, from the Post-Dispatch database, to come up with a total for 2011 and 2012, and calculated the change between years. I sorted the schools based on their 2012 sum, best to worst. I highlighted in red subject scores that dropped from 2011 to 2012 (click to enlarge). Note also the statewide results at the bottom. As you see, the top two scorers were from the Fox district, with Seckmann taking the top spot after being in third place last year. Fox was again in second, and DeSoto (they of the suspended superintendent) plummeted to fourth due to a big drop in passing math scores. The newcomer to the county, Jefferson High, placed third in its third year of existence (I believe). DeSoto had the second-biggest drop from 2011 to 2012, behind Grandview, which dropped 30 points and down to last place. On the whole, you see a lot of red numbers on this table. . The two Hillsboro-area schools, Hillsboro and Grandview, brought up the rear (along with the kids at Sunrise). There appear to be some discrepancies between the AYP Grid and the Achievement Report scores. For example, the Grid says DeSoto High kids passed comm arts at a 88.7% rate last year, but the Report says 77.8. The respective math numbers are 83.2 and 78. Maybe there are some adjustments that are done to the Grid numbers. Comparing the two sources for Fox High shows that the numbers are within a percentage point. It is useful for parents and citizens to be able to compare schools in this manner. It is hard to evaluate anything without having something to compare it to, and because of these scores, we can compare. This is not an end-all-be-all evaluation; there are other factors to consider (like FOOTBALL), but with this info available, we can hold our school boards and administrators accountable. So go do it.